The word ovelias (pr. Oh-veh-LI-as), comes from the ancient Greek word “ovelos” which used to be a wooden or steel rod, where pieces of meat were skewered on and slowly cooked. 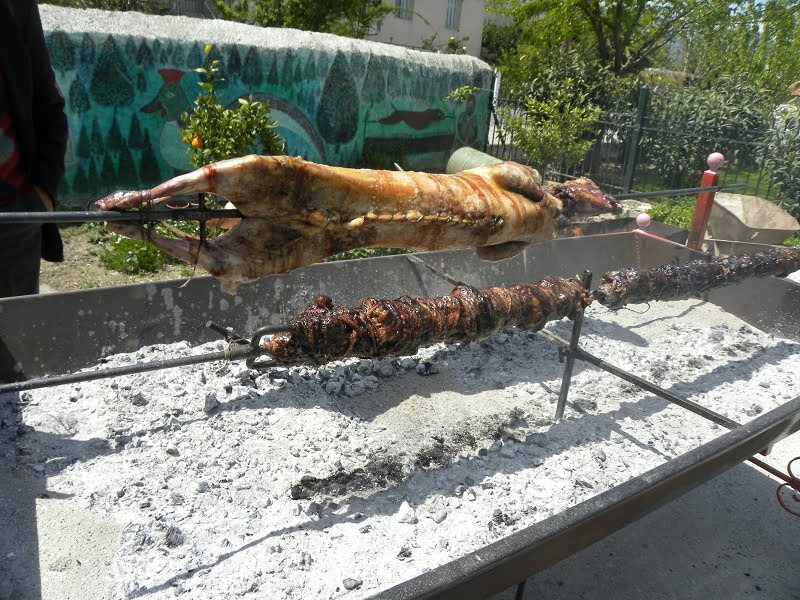 Nowdays, the word “ovelias” means a whole lamb cooked for Easter on the spit. The preparation of the lamb and of its offals is usually my husband’s job. It’s not an easy job to do and of course the women in the family help out as this is not a one’s man job to do. He used to be the only male member of the family who knew how to make ovelias and kokoretsi but as the years pass, he has trained other members to do this. During the Easter holidays half the population of Athens celebrate Easter at their villages or at their relatives’ villages. Like the majority of the Athenians we drive away from this crazy city to relax and rejoin again with our relatives, who live in Sparta. Sparta is about 2 – 3 hours drive away from Athens but some times, during the Easter holidays, it may take even four hours to reach there. Greek families usually gather together and celebrate on such occasions and we end up being more than twenty persons on Easter Sunday. The preparation of the lamb starts from the previous day. It is washed, seasoned and tied on the spit so that it is ready early in the morning to go on the spit. It is then covered with napkins and it is left all night, vertically on the spit, to drain and absorb the flavours of the seasoning. The same applies to making Kokoretsi, which needs even more time, as the thorough washing of the intestines takes a lot of time. The intestines are turned inside out and carefully washed, then rubbed with salt and often soaked in vinegar or lemon juice and water. On Sunday morning, my husband, together with my brother in law, get up early in the morning to prepare the fire. My brother in law makes the fire by burning olive tree logs in a fire pit until they turn into hot charcoal. The charcoal is then put in the roaster and the lamb starts to roast. The lamb takes a lot of hours to cook, about 5 – 6 hours for a lamb around 10 – 12 kilos, but a lot of fun goes on while roasting. Usually folklore music is playing loud and a lot of mezedes are served through the whole procedure. The lamb is roasted together with a Kokoretsi and if there is leftover caulfat and lamb offal, we also make Tourkakia., a recipe we learnt in Sparta. If the charcoals are about to extinguish, remove the lamb and blow air on the charcoal by using a hair dryer to light up the fire again. When some of the fat melts on the charcoal the fire may light up, so just put it out by throwing some coarse sea salt on the fire. There should always be some backup wood burning to add to the roaster, in case it is needed. Depending on how many guests you expect, plan on approximately 500 grams / 1.10 lbs of lamb per person. I have taught my sisters-in-law to make sheftalia, which although a Cypriot delicacy, everybody loves, so we always make some. They never make it to the table as they are cooked before the lamb, so their lovely smell attracts everyone around the spit. They are usually devoured during the roasting procedure, accompanied together with some ouzo. So does the kokoretsi, which is cut and eaten piece by piece directly from the spit. If you do not want to roast a whole lamb, the alternative solution is Kontosouvli (called souvla in Cyprus) or if you do not have a rotisserie, you can make Lamb Kleftiko or Lamb Bogana, which are equally delicious. In Cyprus, the tradition is quite different as instead of ovelias, they make Souvla, which in Greece, is called kontosouvli. The Cypriots love souvla, which means skewer, so they don’t need an excuse to make one, as they make it on every occasion and opportunity. Everybody (well almost everybody who does not live in apartments) has a barbecue in their back yard, so it is very easy to have this delicious meat whenever they like. Whenever we cannot go to Sparta for the Easter holidays, we enjoy making souvla (kontosouvli) in Athens, on our small balcony. The best meat to make souvla is from the neck or the shoulder of lamb. The meat is cut into big chunks with the bone, washed and then generously salted. It is then tightly skewered on a spit and is cooked over a charcoal barbecue. There are many variations of souvla, either marinating the meat in red wine, or adding more spices. Start the fire about an hour before cooking. This will depend on the type of charcoal used. Souvla (in Greek kontosouvli) is a popular dish from Cyprus. It consists of large pieces of meat, usually lamb, cooked on a long skewer over a charcoal barbecue. Cut the meat into big chunks, the size of your fist (or 10 - 13 cm / 4 - 5 inches). Marinate the meat with all the ingredients for a few hours and skewer the meat on the spit, distributing the fatty parts among the meat. Set the meat on the rotisserie over high heat and high speed. You do this so as to sear the outside of the meat and seal inside the juices and flavour. Then place it higher on the rotisserie and leave it turning until it is cooked, about 2 – 3 hours, depending on the age of the lamb, basting regularly with the marinade. Serve with lemon juice on top. The recipe for souvla are well as many more Cypriiot recipes, are included in my cookbook Mint, Cinnamon & Blossom Water, Flavours of Cyprus, Kopiaste! and in Volume 1 of my e-cookbook. The lamb is washed and is rubbed with a mixture of salt, pepper and oregano both inside and outside.Then the lamb is tied on a metal spit.The spit has to go in from the rear, through the body cavity and out through the head.The back legs are tied on the spit with a wire so do the front legs with the head.Also you must wire the lamb on the spit from the inside of the cavity around the spit and through to the back of the lamb, encasing the spit and the spinal cord so that it secured and it does not fall apart. The stomach cavity does not have to be sewn as it serves no purpose. The whole roasting will take about five or six hours depending on the size of the lamb and at the beginning it should be placed on the highest level and once it is on fire it should be rotated continuously, at the beginning quickly so that the lamb will cook well all way through and not only outside.Gradually you can move the lamb downwards.You must not forget to baste the lamb frequently with the ladolemono mixture.The basting should continue until the lamb is done and the skin is crisp. I was just watching the traffic out of Athens on the Greek news, and it does not look fun. Best of luck and have a wonderful, wonderful Easter. I can’t wait till tomorrow! The mysteries of kokoretsi revealed! Sorry Ivy to have to say, but your pic is not showing. Thank you Laurie for your wishes. Lulu, Kokoretsi will be posted tonight. Rosie, shall try and fix the photo, thanks. Val, I too hope that we may eat roasted lamb together one day. Mmm, the best! I hope you had a nice Easter, Ivy. Christos Anesti! I know that tastes wonderful!! Happy Easter to you and your family. Happy Easter and have a lovely time with your family.